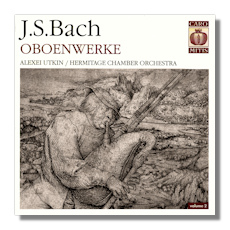 This is the second in a series of three CDs presenting some of Bach's best-known music in arrangements for oboe. Reviews of the others will follow. It's finely performed for the Russian label, Caro Mitis, which forms part of the Essential Music company, formed in 2003 in recognition of the publishing practice from the 1920s and 30s of the same name. Caro Mitis plans to issue at least a dozen SACDs a year, of demonstrably high audio standard, by Russian musicians, and of unusual musical appeal. The enterprise partners with Philips and Sony and high-end recording equipment manufacturers, Polyhymnia International. This trend of emphasizing format, presentation and repertoire has many happy precedents. If these SACDs are anything to go by, that trend of success may well be followed by Caro Mitis, which means "ripe (or succulent) fruit". It certainly deserves to. On this disc we hear the C Major Overture, or Orchestral Suite #1 (BWV 1066), the D Minor Double Violin Concerto (BWV 1043), the Italian Concerto (BWV 971) and the G-minor Sonata, usually played on harpsichord and recorder (BWV 1030b). The justifications for using the oboe are many and entirely acceptable: the choice of performer(s) on any one occasion called upon to play we know was fluid and mutable. In particular, the musical conversation between musicians was what provided the melodic, harmonic and textural drive and movement. Exactly how that happened, which instruments took which parts, was secondary. This translates into "trio-thinking"… in which the Baroque composer, however intricately-involved in the "production" of their music, handed it off for interpretation, where it lived a life of its own. This is clear especially against the background of the dance – more of an influence on Bach than we may at first acknowledge. In the case of BWV 1043, for example, manuscripts do survive: they include, unusually, a fully written-out part for the string continuo. While a version from 1736/37 is for the flute in B minor, the "melody-bearing" soloist's part in the earlier (possibly the Cöthen period) is lost; but it's in G minor – highly suitable for the oboe. Similarly the dramatic relationship between soloists and ripieno, and between the soloists themselves in BWV 1043 suggests that it's the tension and dialog that matter most. To hear Utkin's oboe alongside a violin (although it's not clear whose) is an interesting, and rewarding, experience indeed. The most pressing question is whether the reconstructions, re-arrangements work. Is the sound convincing, persuasive, ideal, or perhaps somewhat off-putting? The answer is a wholly positive one. It works. However rough the edges some aspects of post production may be at this stage, not only ought the momentum generated by Caro Mitis to be enough to smooth them; but also the imagination, research – and presumably trial and error – that have gone into these performances make them most pleasing. In the first place this is no showcase for oboist Alexei Utkin; he doesn't have a huge discography but is clearly a thoughtful musician concerned to use his instrument to articulate the ideas of the composers he plays. Preferring a modern instrument, Utkin is also Artistic Director of the Hermitage Chamber Orchestra. His sound is neither over warm nor breathy. It's business-like, full of appropriate tension in the interest of a kind of polished but far from metallic purity. Equally importantly, Utkin's approach to the solo status of the oboe blends perfectly with the music he leads and supports. His Bach is a Bach we are familiar with and can enjoy and marvel at as we always have. Very perceptive playing, and successful. The booklet has background essays in English, Russian and German. They're informative – but only once you've picked your way past many oddities in translation: "There is the only way to answer these questions, that is – to comprehend the special features of the baroque music, its key categories," for example. It would pay the label to bring its accompanying material up to the same standard as the interpretations and recording of the music it has chosen to offer, which make it a wholly welcome addition to the catalog.